Let’s talk about decisions, shall we? I don’t know about you, but I for one, hate making them. I’m talking about literally the smallest decisions there are. Like in the ice cream store when they ask if I want chocolate, vanilla or mixed. Um, so I know I don’t want plain vanilla; my love of chocolate is just too strong. But as between chocolate or mixed…I don’t know! How should I decide? And when the decisions get bigger, oy. Don’t get me started. I hate decisions. That’s why this dessert is so darn awesome! Say you just finished a humongous meal, like, the biggest one of the year. It’s time for dessert, and you don’t have much room. Imagine choosing between a fudgey chocolatey dessert and a fabulously decadent pecan pie. I’m getting stressed out just THINKING about a decision like that! Enter pecan pie topped fudge brownie pie. I know, right? Just thinking about that makes me drool. It’s totally as decadent as it sounds. First I started with a pre-made pie crust. Because I’m not as crazy as you think I am. Next I baked it a bit. Then I filled it about 3/4 of the way with the fudgiest brownie mixture you’ve ever seen. Baked that a bit, then topped it with some fabulous pecan pie mixture. Baked the whole thing one last time, and then took the most amazing dessert out of the oven. Oh. And I made these mini because my name is Miriam and I’m addicted to making things mini. Not sure if there’s really any decision left here. Just make these. Now, preferably. Brownie mixture slightly adapted from King Arthur Flour, Pecan Pie mixture loosely based on Karo Syrup bottle recipe. Place pie shells on a cookie sheet. Bake at 350 for ten minutes. While pie shells are in the oven, prepare the brownie mixture. Melt the butter in a double boiler or microwave. Add the sugar and stir until smooth. Return to heat and stir until hot but not bubbling. Remove from heat and add cocoa powder, baking powder and salt. Stir to combine. Add the eggs, one at a time, whisking until smooth. Add the flour and stir until smooth. Pour the filling into the pre-baked pie crusts, filling them about 3/4 full. Put the pies back in the oven and bake for 10 minutes. After ten minutes, check that the tops of the pies are just firm enough to support additional weight. If not, bake for another minute or two. If it is, proceed to next step. While brownie pies are baking, prepare pecan mix. Whisk all pecan mixture ingredients except pecans together in a small bowl. Add the pecans and stir to combine. Pour a small amount of the pecan mixture over the partially baked brownies, enough to cover the top. Place back in the oven and bake an additional 15 minutes. Remove from oven and serve hot. You can make these in advance, freeze them, and warm them up for a couple of minutes just before serving. 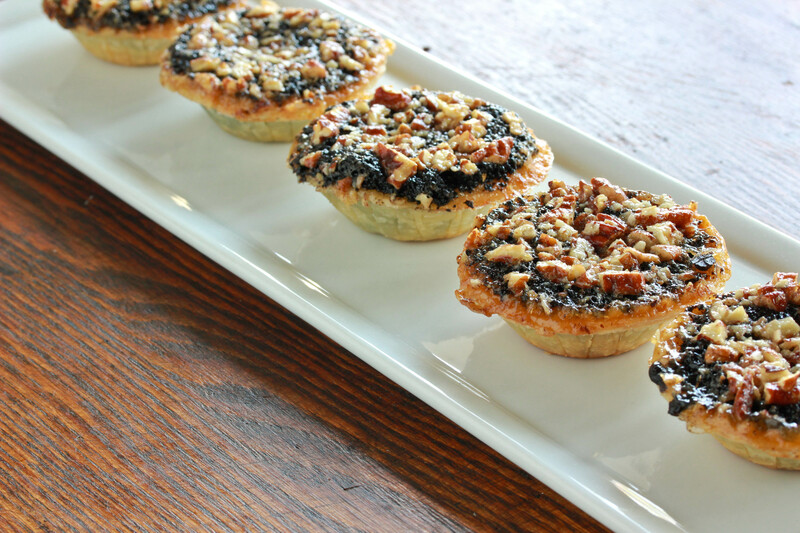 These would be perfect for Friday night dessert! Mmmm need to invite guest to impress…. Is this the type of pie shell you find in the freezer section? these are PRECIOUS! i think i am going to make these little guys for thanksgiving now! love, love, love! ohmyohmyohmy these look awesome! I can’t use pecans but chocolate with pecan-type filling is too good not to try. I’ll substitute almonds. What a winner! The only decision left is how many to eat!! Love love love the idea! Genius! This certainly looks like a chewy and nutty little tart! The family loved them. Thanks. I love how you combined 2 favorites into one dessert. 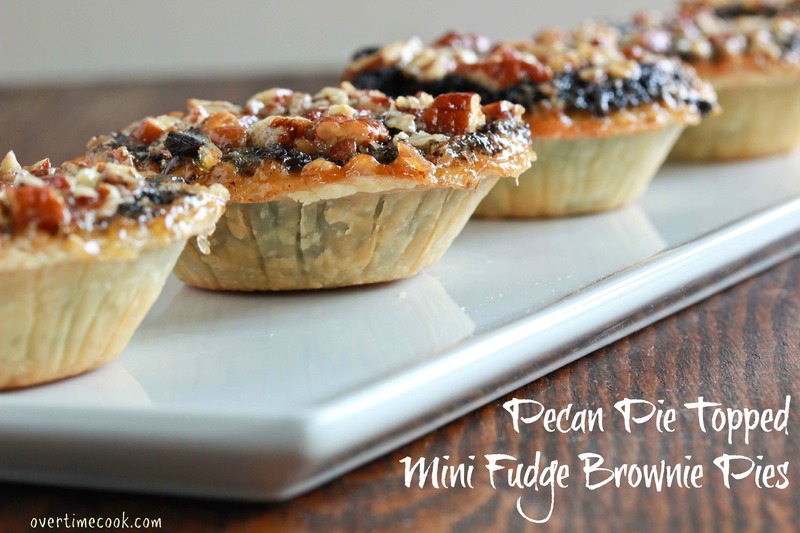 I’m a huge fan of pecan pie so I’ll definitely have to give them a try! Adorable pies and awesome photography. These look awesome! I can’t wait to try them!! Oooh, served warm . . . what a great idea! Yum! This is a dangerous dessert, lady! I made these for Friday night and they were amahhhhzing! Since I made so many I gave some to my friend, to my parents, and to my in-laws. EVERYBODY LOVED THEM! Thanks so much for this recipe, will definitely make again! made them for friday night were a major hit!!! so easy…..def my new dessert recipe!! can you use a regulare size pie crust? Yes but adjust the baking time. 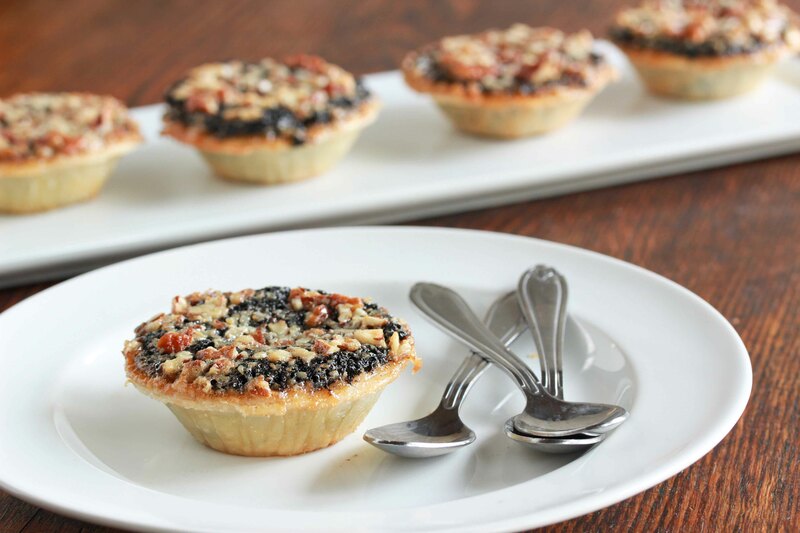 How many regular sizes pies would this recipe yield? am i supposed to melt the margarine for the topping? What would be good to serve with this besides ice cream? These are so delicious and rich you can really serve on their own – tho ice cream would be delicious on it! these look amazing. just wondering if u have a pie crust recipe. Im in aussie and don’t think u can buy these pre made. Do you melt the margarine for the topping? About how much pecan mixture on top? A Tablespoon? More? How would you adjust baking time for making it in a big pie crust?